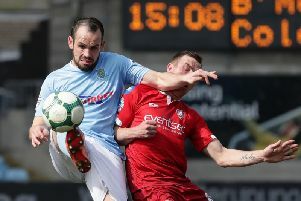 David Jeffrey felt the timing of Ballymena’s goals was key as they made a flying start to the new Danske Bank Premiership season. Willie Faulkner broke the deadlock at Dungannon with a lobbed finish in the 32nd minute. Then, as the Swifts threatened a comeback in the second half, Tony Kane made it 2-0 from the penalty spot. Jeffrey said: “We are pleased - I’m on record as stating that Dungannon, under Rodney McAree, are one of the finest football teams in the league. “This is never, ever, an easy place to come, and obviously we’ve so many new players to integrate in. “It is one thing doing that in pre-season, but when the competition starts it’s totally different. Jeffrey added: “The credit must go to the players because we can give them direction and instructions, but unless the players buy into it, it doesn’t have any effect. Dungannon’s best spell in this game came after half-time, before Ballymena’s second goal. They created several chances, with Cormac Burke and Daniel Hughes going closest, but couldn’t get the equaliser. Swifts boss Rodney McAree wants more goals this term, and admits they have to improve. “We got off to a bad start last season and we want to try and get points on the board as quickly as possible this time,” he said. “We want to start creating more chances than what we have done today. And while it was a disappointing start, McAree knows there is no point in feeling down. “The players are still getting themselves 100% fit,” he added. “At the end of the day we can’t look on one defeat at the start of the season as being how our season will pan out. McAree was encouraged by the performance of his summer signings, particularly teenage goalkeeper Alex Moore, who has joined on loan from Linfield. “I thought he did extremely well - it’s difficult because he has only had a week with us,” he added.